No party? Oh, of course, you had an awfully busy day on the phones yesterday. They're just exhausted. Yesterday we had them hopping with our matching donation challenge and our day dedicated the the foster program. You'll be happy to know because of Ms Lillian Lincoln and your generous donations, we raised over $3 squillion for the program! Excellent!!! The girls are tired, let's let them rest. Don't worry, you can still donate. All you have to do is pay a visit to our fundraising page. We've got 14 days until our fundraiser ends, and still have a long way to go. To make a tax-deductible donation and help homeless cats and kittens out, please visit here. That little spotty tummy of Phoebe's is adorable! 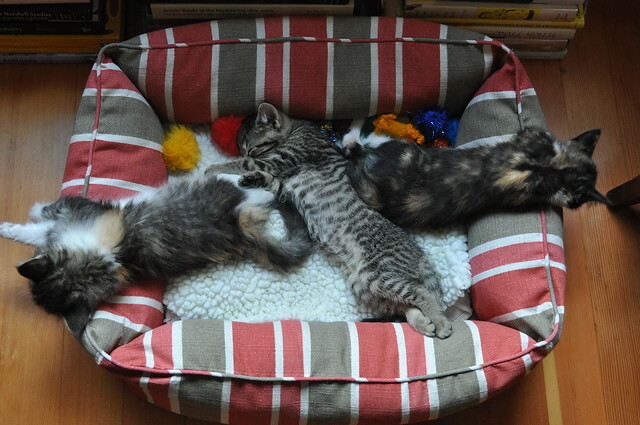 Some tuckered out kittens! They sure have been working hard to help their fellow feline kind, haven't they? Sigh - that 2# / 2 months thing get me every stinkin' time!!! “That must have been quite a party.” Have. Hee. Kitties all passed out. :) Mine are getting to that stage too.